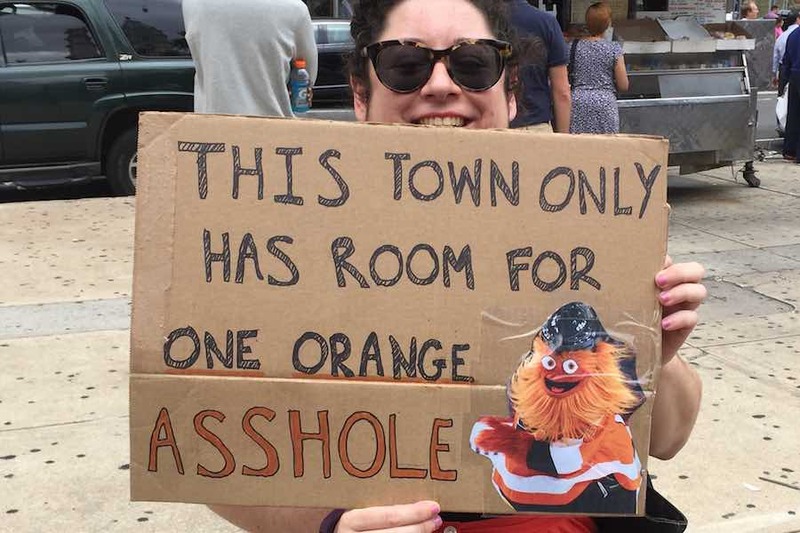 Leave it to Gritty to defeat Trump and Vladimir Putin and other enemies of America. The annual Lobster Club Mummers Parade in Philadelphia always has some colorful skits, the 2019 edition proving no exception. A skit depicting Donald Trump teaming up with Vladimir Putin to imprison Uncle Sam — only to be stopped by Philadelphia Flyers mascot Gritty — proved that once again, the Mummers Parade in Philadelphia never fails to get political. The traditional New Year’s Day event has been going on for hundreds of years. It’s made up of various divisions, specializing in music, skits or sheer revelry. But when it comes to satire and political commentary, that is solidly in the domain of the Comics Division. The Lobster Club, part of the Goodtimers Comic Club, put on the skit which was loaded with references to various controversies connected to President Donald J. Trump. It had Trump carrying a large prop made to look like a VHS tape with the letter “P” on it (a reference to the alleged pee tape mentioned in the Steele dossier) and concluded with Trump being arrested by the FBI.